"Seasoned fried chicken is served with a rich gravy made from the pan drippings. It's down home goodness that's definitely not for dieters! Takes some preparation, but is definitely worth it. Enjoy!" In a medium bowl, beat together 1/2 cup milk and egg. In a resealable plastic bag, mix together the flour, garlic salt, paprika, pepper and poultry seasoning. Place chicken in bag, seal, and shake to coat. Dip chicken in milk and egg mixture, then once more in flour mixture. Reserve any remaining flour mixture. In a large skillet, heat oil to 365 degrees F (185 degrees C). Place coated chicken in the hot oil, and brown on all sides. Reduce heat to medium-low, and continue cooking chicken until tender, about 30 minutes. Remove chicken from skillet, and drain on paper towels. Discard all but 2 tablespoons of the frying oil. Over low heat, stir in 2 tablespoons of the reserved flour mixture. Stirring constantly, cook about 2 minutes. Whisk in chicken stock, scraping browned bits off bottom of skillet. Stir in 1 cup milk, and bring all to a boil over high heat, stirring constantly. Reduce heat to low, and simmer for about 5 minutes. Serve immediately with the chicken. YUMM! 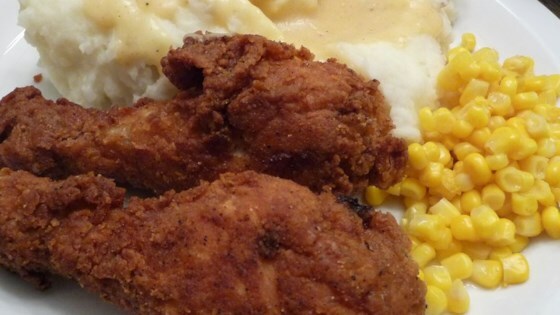 This is one of the best fried chicken recipes I have tried! The gravy was good, but I did add quite a bit of garlic salt, salt and pepper. The chicken was very moist. Great recipe!